PAY FOR YOUR JURA ONLINE AND GET 5% CASH BACK REFUNDED TO YOUR CARD ON YOUR ENTIRE ORDER! ORDER BY EMAIL OR PHONE USING BACS, CHEQUE OR DEBIT CARD GET 7% BACK! The Jura X5/Z5 is an excellent machine, combining the one touch operation of its bigger brothers the X7/X9 with the compact and lower price point of its little sisters the XF70 & XS90. Ideal for quality with convenience where high cup output is not required but low price is. Now, fabulous coffee comes to the office, at the touch of a button. Apart from making a top-quality cup of coffee, all maintenance is at the touch of a button. 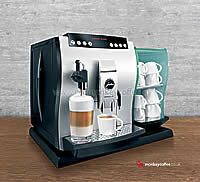 Where a daily capacity of around 50 cups is called for, the compact IMPRESSA X5 / Z5 has got what it takes. 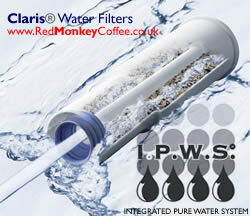 No Mains Plumbing Option - This model can not be plumbed into the mains water supply, it can only be used by hand/jug/bottle filling the water tank, this also means you will need to use Claris Water Filters to protect it from limescale. The Jura Impressa commercial range of bean to cup coffee systems are characterised both by there advanced technology and its user-friendly operation. This machine is sophisticated and simple to use, requiring no mains water if not available so the machine can be setup anywhere, no technician or training is needed. The instructions are simple and easy to follow, the results are amazing, your own swiss engineered robotic barista and with the Jura X5 / Z5 you have the convenience of one touch milk and coffee without moving the cup! 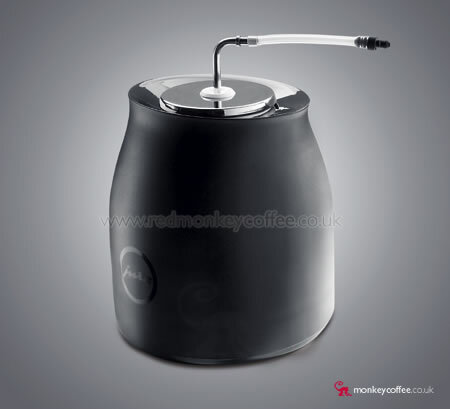 Red Monkey Coffee's Clear Honest Suitable Use Guide, Suitable for: office, bar, restaurant, hairdressers, conferences & seminars, car showroom, meeting rooms, receptions and of course the home!. Note: This machine is not suitable for coffee shops, it is not intended nor would the warranty cover it for constant heavy commercial use every day, if you require a machine for over 50 cups we would recommend the Jura X7 or X9 models. All the machines can be used to whatever level you wish and there is no reason why they would not handle it but if a fault occurred the warranty may be invalid which would mean the repair would be chargeable, the machines log the number of cups produced. "One touch is all it takes" is our motto with the IMPRESSA Z5. It may not be able to read your preferences from your face, but your finger tips will do the trick. For the first time ever it is now possible to make a cappuccino at home without moving the cup. 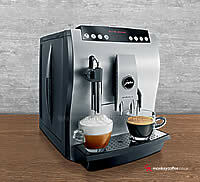 This advance opens up all kinds of new possibilities and turns you into a veritable barista in your own kitchen. The IMPRESSA Z5 actively helps you to save energy. With the ESM (Energy Save Mode©), the machines energy-saving potential can be adjusted entirely to your habits and you can save up to 40 % of the energy normally required. And if you happen to be away for a lengthy period of time, the machine can be disconnected completely from the power supply. The IMPRESSA Z5 puts an end to the sound of empty coffee grinders and half-empty coffee cups once and for all because it tells you in good time when you need to refill the bean container. And it's all made possible by an innovation from JURA: the amount of beans in the container is monitored constantly and as soon as they drop below a minimum level an alert appears on the display. Simply turn and press to navigate your way through the entire range of operating and programming steps while keeping an eye on the graphics appearing on the display. So no matter whether you're selecting coffee strength, adjusting the amount of water or giving your coffee specialities their own names, the rotary switch literally reduces everything to a twist of your wrist. The IMPRESSA Z5 speaks your language, either in clear text messages or readily understandable graphics. It communicates with you and takes you to your favourite coffee specialities by the shortest and most direct route. The interactive clear text/graphic display guides you swiftly and smoothly through every stage of the program. Give your IMPRESSA Z5 a personal flavour all of its own. In a few simple stages, you can change your greeting text or enter names for your favourite coffee drinks and they will appear on the display when you push the button! . It couldn't be more personal or individual. The height can slide between 70mm and 111 mm. This permits adjustment to accommodate different cup heights. The crema is preserved and no coffee splashes onto the appliance. At Red Monkey Coffee we have broken it down for you so you can see exactly what extra you get on each model & what is the standard, remember its also the look, design and style of the machine which is one of the biggest differences, the X5 is more compact than the X7/X9, it is also one of the best looking Jura machines, it is highly recommended. • Volume of waste grounds max 30 portions can be held before needing emptying. £119 worth of credit to apply to any other products on our site, £2 leway. Simply list items in the comments box on order page. If you dont mind what items you have and you dont list any items on the order page, a default selection of items will be sent as listed on the bottom of the page. Plus pay by DEBIT CARD, Cheque or BACS & get an extra 2Kg of coffee or £30 extra credit! Click the add one graphic & the quantity will appear in the box any problems call 0870 207 4831 or email. Note: Free Extras do not come with this separate cup warmer. Difference between the warranties - The machines are identical, but the commercial warranty covers 50 cups per day and the domestic only 10 cups per day, difference is the Jura X5 Commercial 1 year warranty covers repairs on site so not period without the machine. 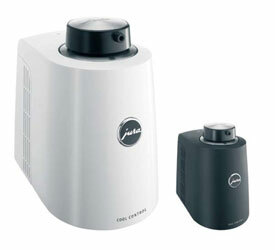 The Jura Z5 domestic 2 year warranty is a return to base, i.e. it will need to be boxed up and picked up by courier to be looked at and then returned by courier leaving you with no machine whilst it is away. Note the Domestic 2 Year Warranty can be made void if the machine is used in a work place or for any commercial purpose, the warranty only covers 10 cups per day under the domestic warranty. Default free items sent if credit is not applied to specific items in comments box on order page: Extra 25 Pack of Cleaning Tablets, Extra 6 Pack of Claris Filters, Extra 1Kg of coffee, 2 Large Bodum Double Walled Latte Glasses, Set of Cocoa Shakers. ©Copyright The Layout, images and information provided on this page and throughout our site are protected by the international laws governing intellectual property, you may not reproduce anything on this site, it is illegal to do so. *Jura Z5 Includes Domestic 2 Year Return To Base Warranty.